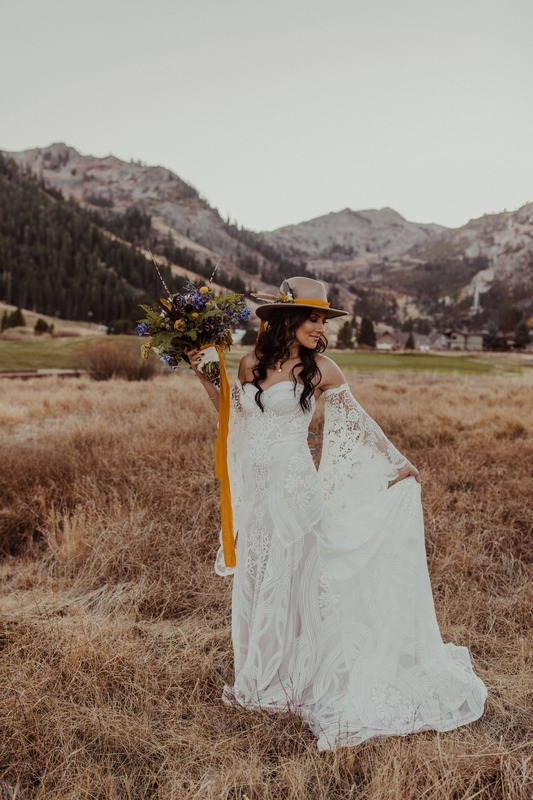 The picturesque Squaw Valley in California was the backdrop for this bohemian inspired fall wedding shoot captured by the talented Kay Kroshus Photography. 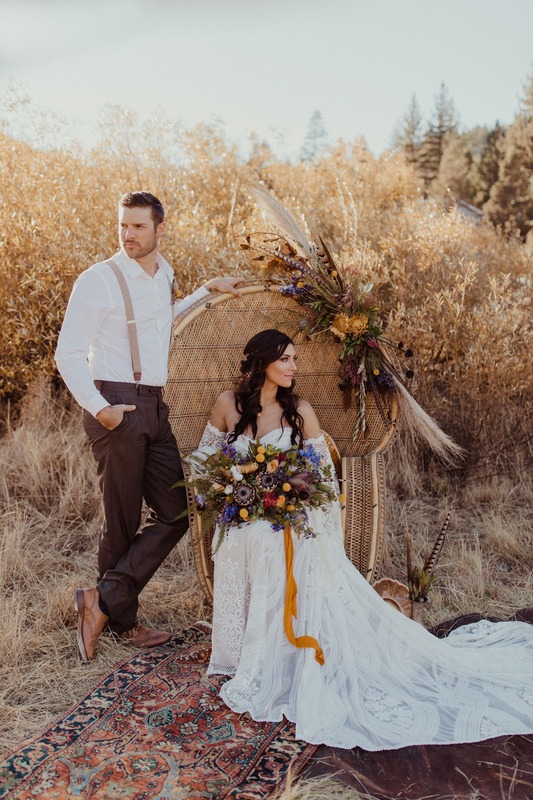 Forget Me Knot Events & Design and a group of talented vendors brought their a-game with this fall boho shoot, which featured warm fall colors, texture-filled florals, the most gorgeous Rue De Seine wedding dress everrrrr, oh, and two of the cutest Bachelor/Bachelorette alums around. 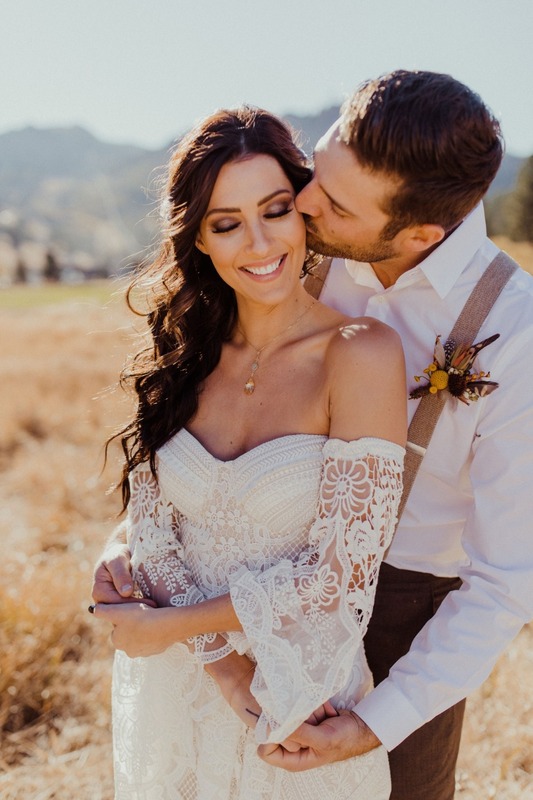 Becca Kufrin and Garrett Yrigoyen, stop be so damn cute! Seriously! 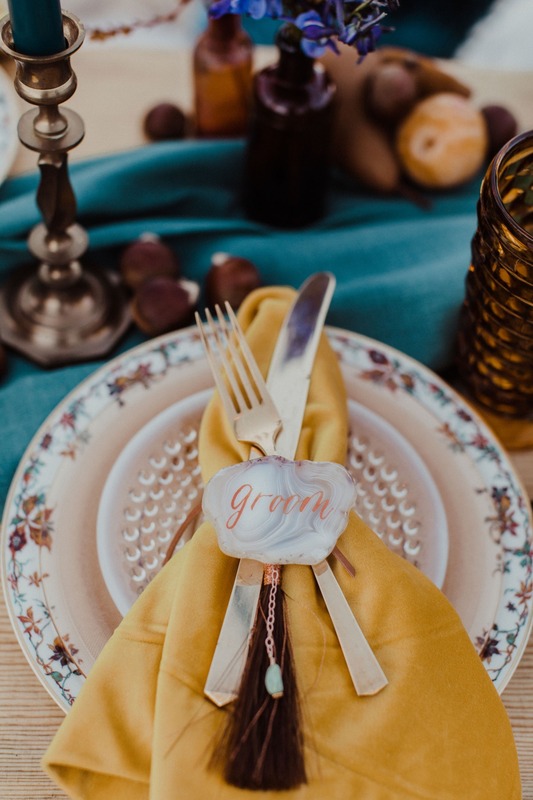 The takeaway? 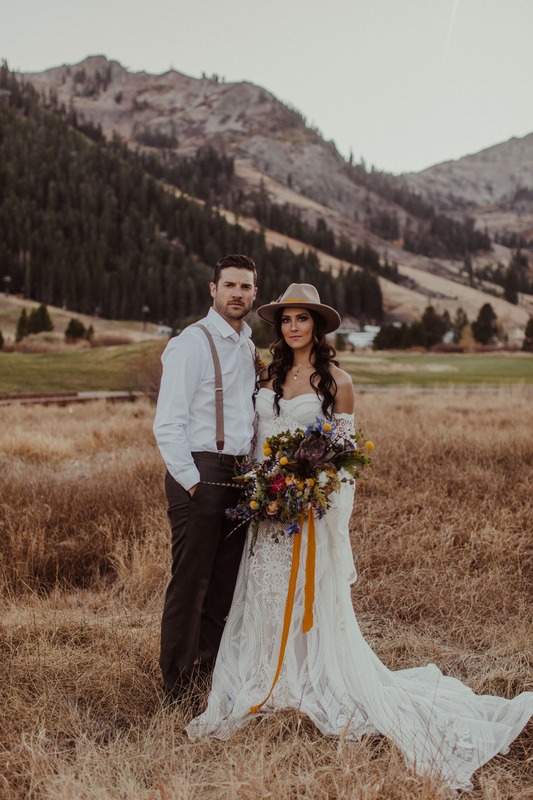 When you take an outdoorsy girl from Minnesota and an outdoorsy guy from Cali and you put them in pretty clothes (feather fedora included) and pose them in the midst of mountains, you get them at their best. 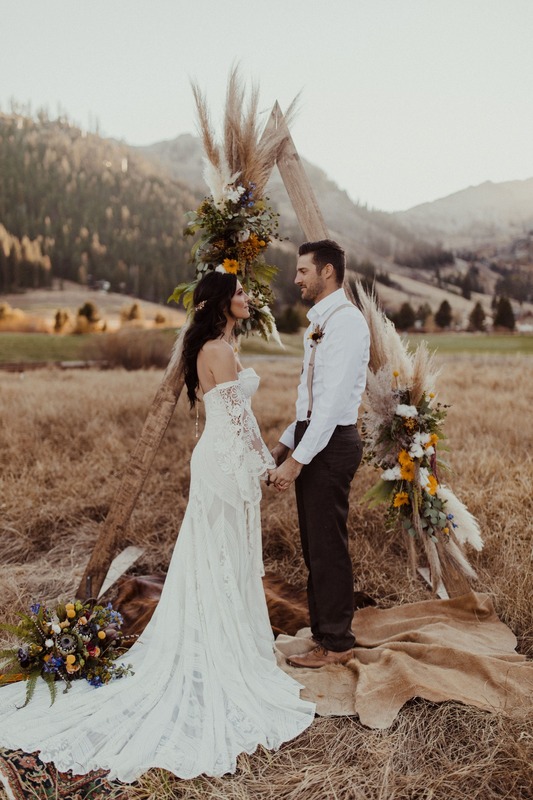 And everyone at home gets to see them stepped outside of their Bachelorette personas - in a free-spirited wedding that’s both adventurous & romantic. 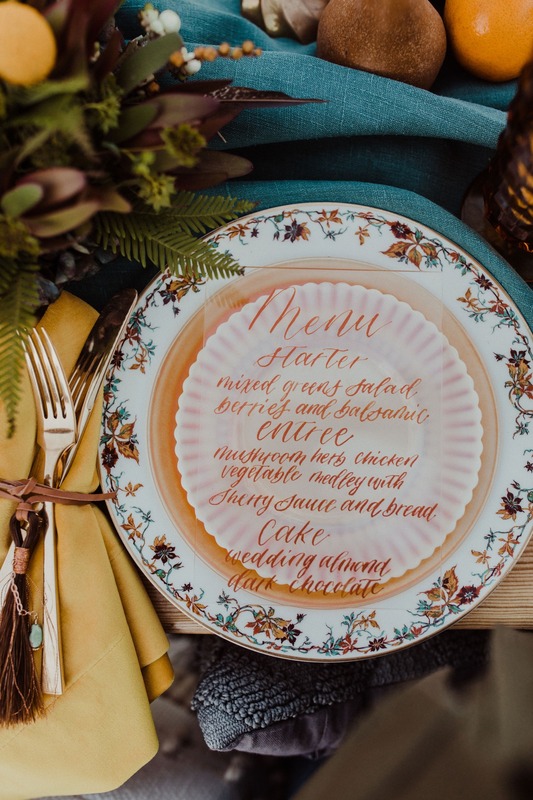 See all the highlights below and find more pin-worthy ideas in the full gallery. 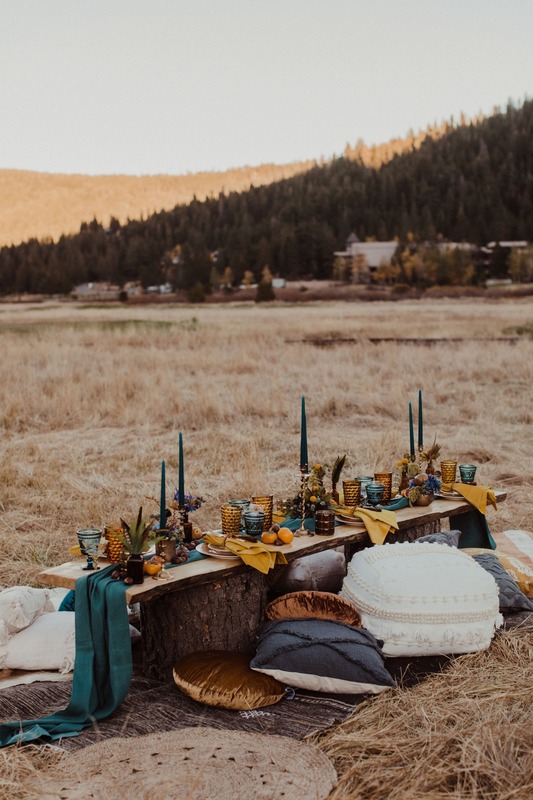 From Forget Me Knot Events & Design: Located among the majestic mountains of Squaw Valley, California, this bohemian fall styled shoot included unique & innovative ideas from all vendors involved. 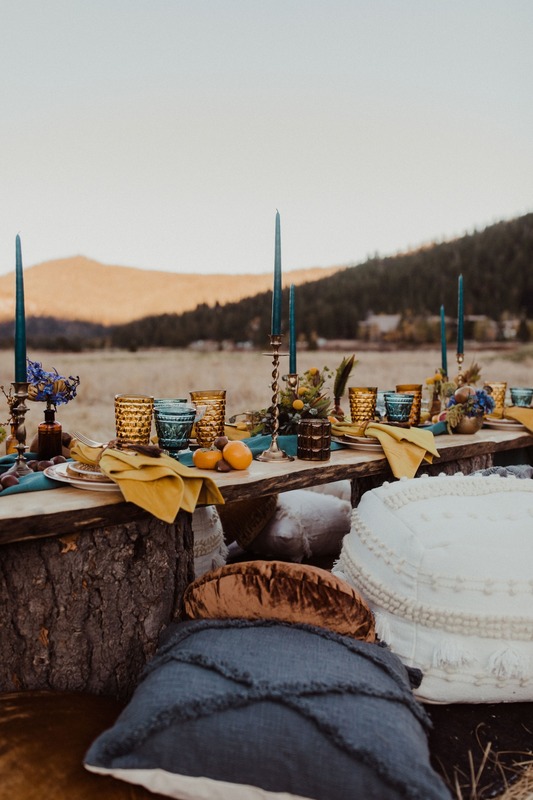 From a handcrafted live edge slab provided by a local Tahoe woodworker to the horsehair tassel napkin rings, every detail was carefully created & placed to create this over-the-top styled shoot. 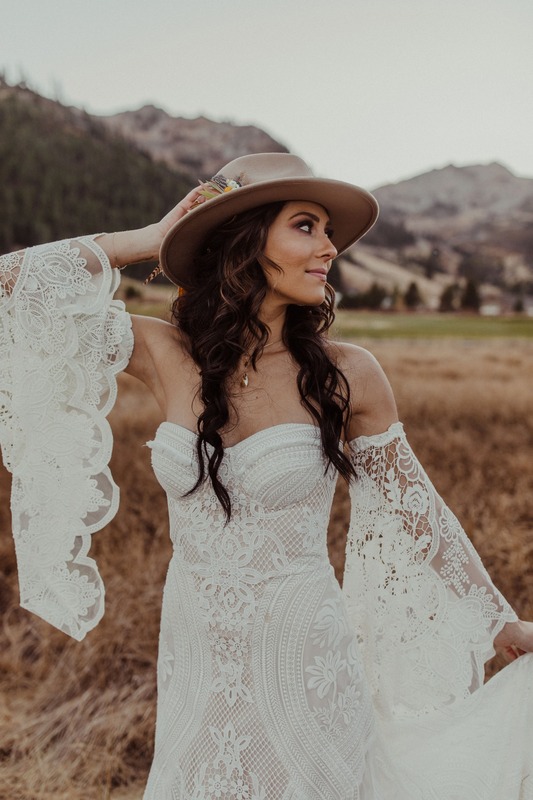 Even though it was a far cry from the glitzy-glam gown she wore when she said 'YES' to Garrett in the Maldives, Becca's Rue De Seine gown, with off-the-shoulder bell sleeves, looked flippin' amazing! 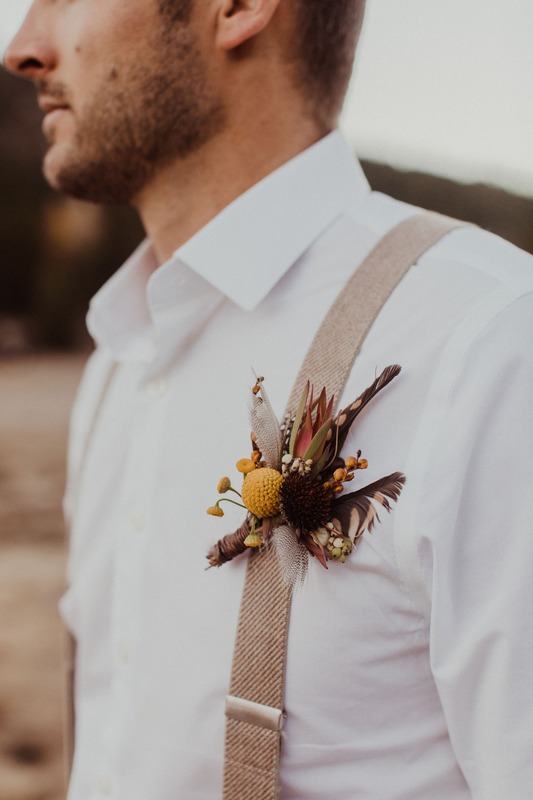 And Garrett's suspenders were so good, too. 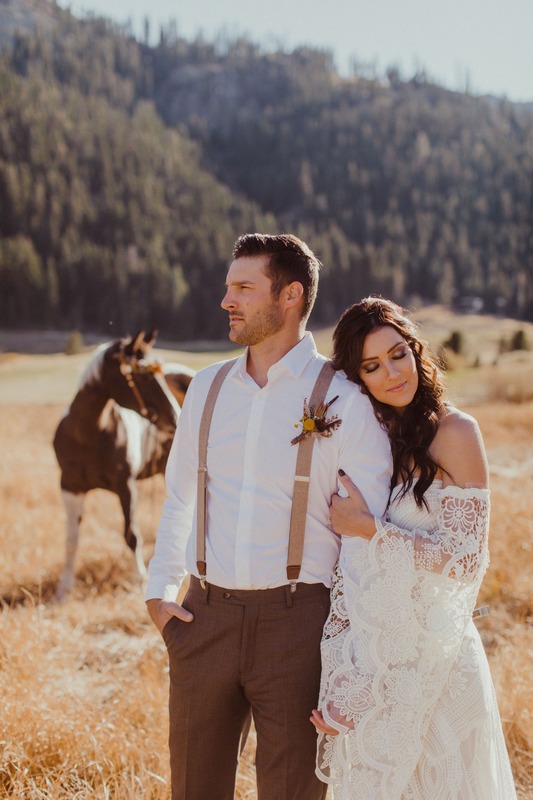 Becca Kufrin & Garrett Yrigoyen agreed to model in this styled shoot & it could not have been more fun. Being around them, you can truly feel their love & admiration for each other. 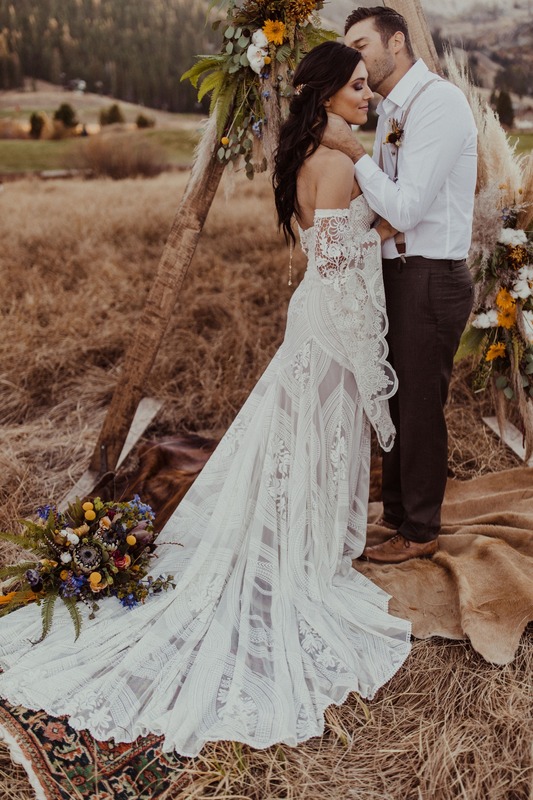 Kay Kroshus did an amazing job creating a comfortable & inspiring atmosphere for them to embrace each other comfortably, and it showed through in all of the photos. 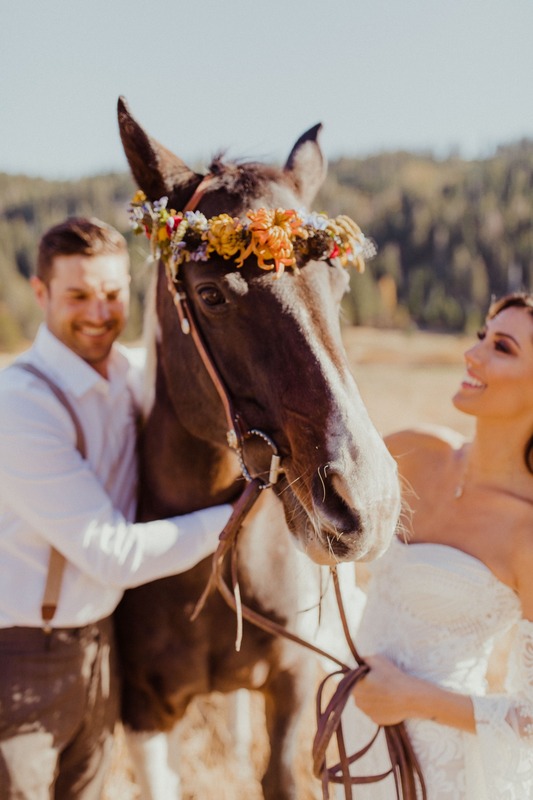 Honestly, the whole vibe was such an appropriate extension to the couple's relationship and falling-in-love journeys on the show. 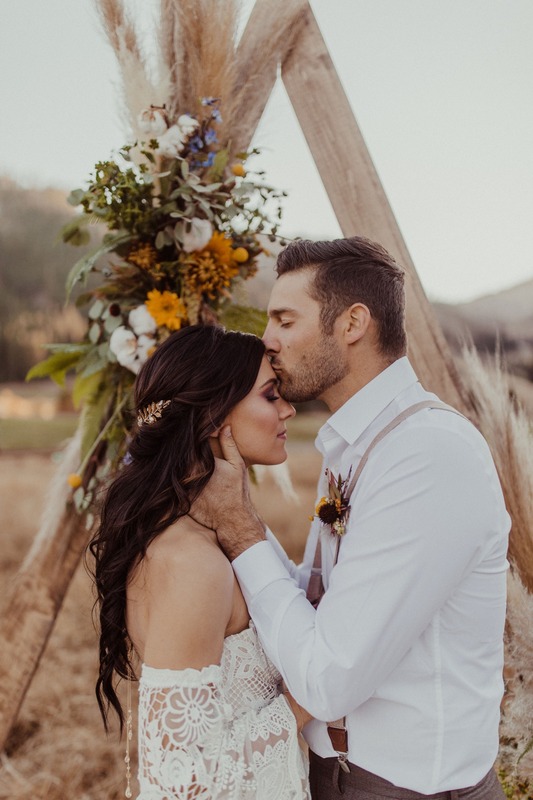 Those perfect pecks on the cheek and forehead, the blissful hangs under the tee-pee, the sweet nose-to-nose nuzzles that seemed to go on forever, all of the captures were authentically B+G. 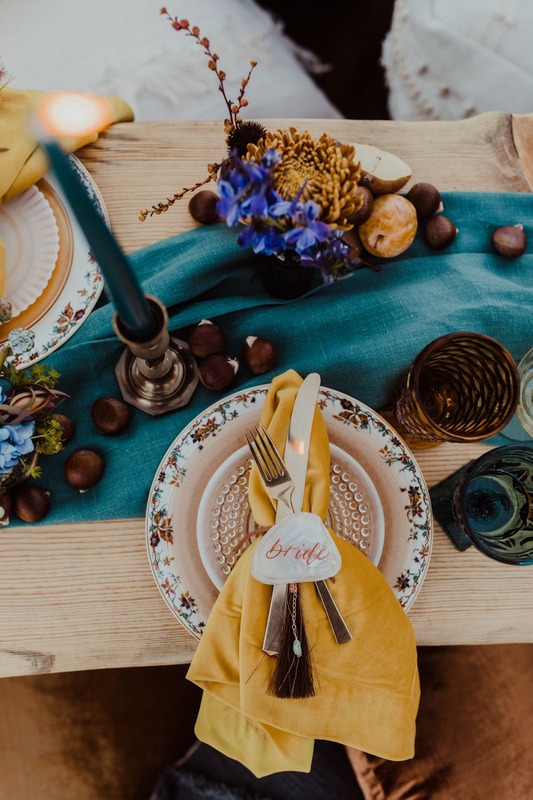 There were so many parts of this shoot that were exciting & interesting. 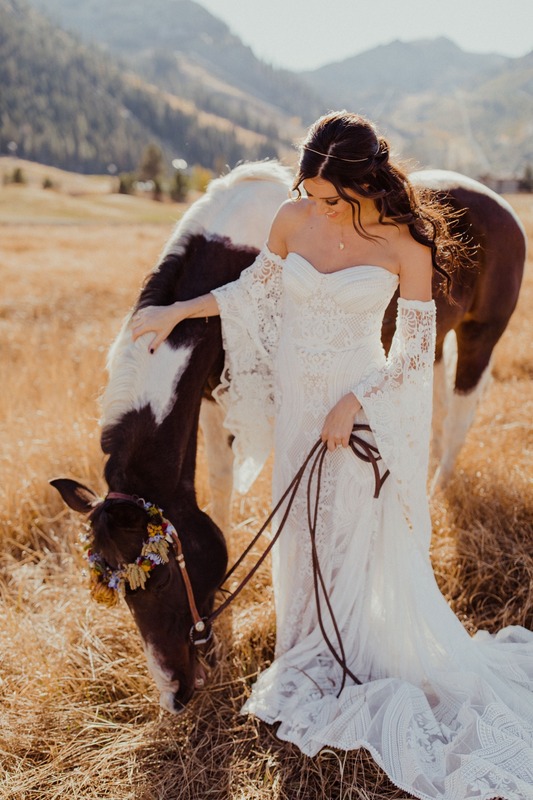 A local Tahoe cowgirl brought her 17 year old trail pony, Scarlet, over to join in the shoot. She was an absolute doll & would do anything for a little treat out of Garrett's pocket. 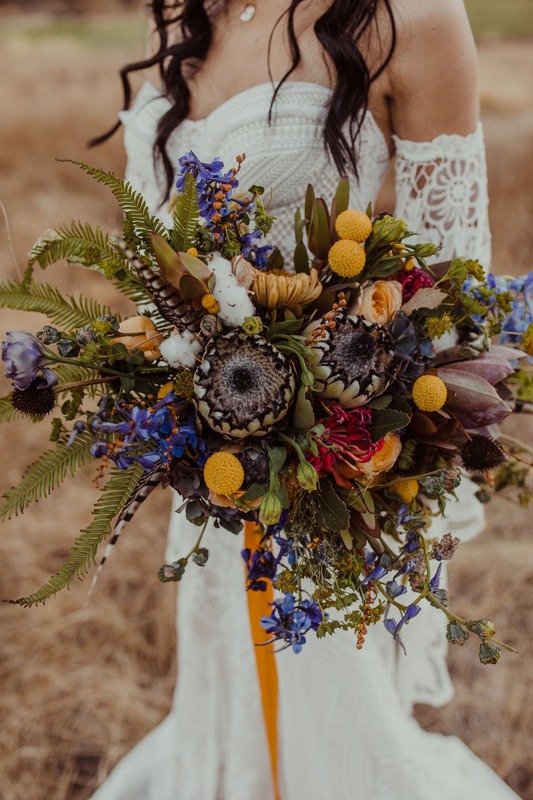 Our hope with this shoot was to create something that was unfamiliar & would spark others' creativity to think outside of the box & be adventurous. 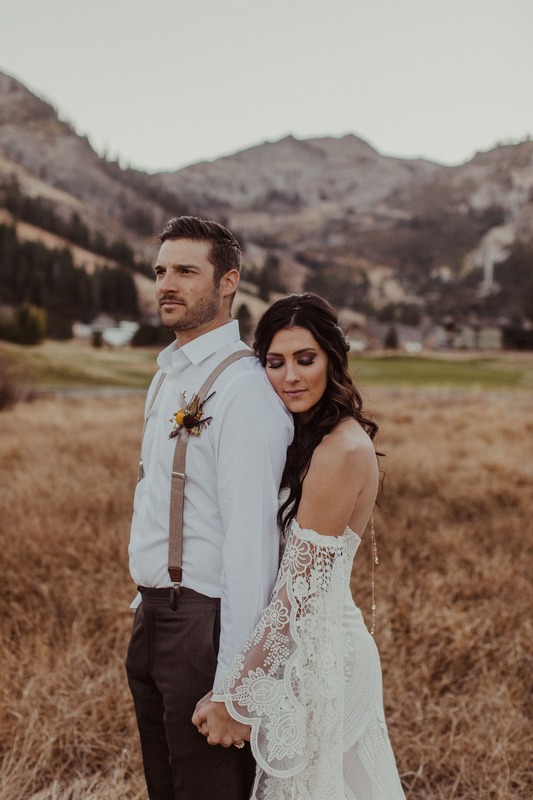 And who better to achieve that than two of the most adventurous, wanderlusty lovers from the Bachelor/Bachelorette franchise. 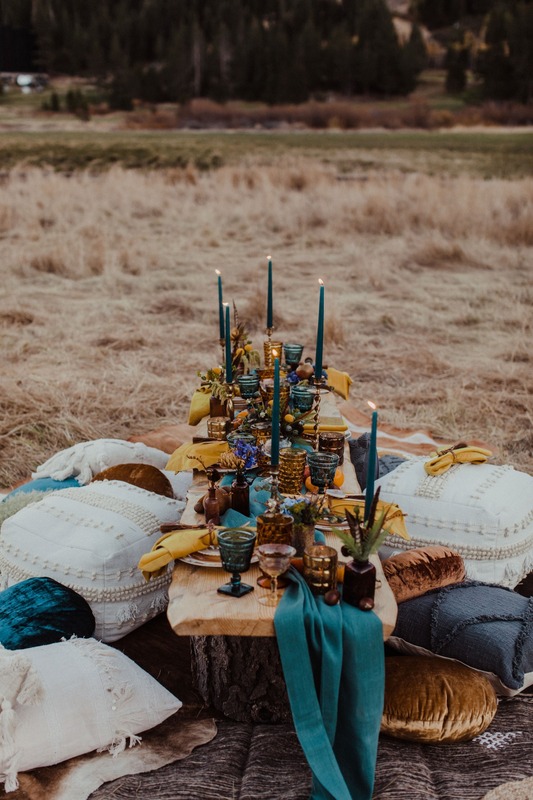 Not sure when Becca and Garrett will officially tie the knot, but if this boho dreamscape is any indication of how they'll do the damn thing IRL, we're all going to want it to be televised.